VIENNA by ORSITALIA: Lux white lacquered wall cabinet living room made in solid wood matt lacquered in Italy by Orsitalia. 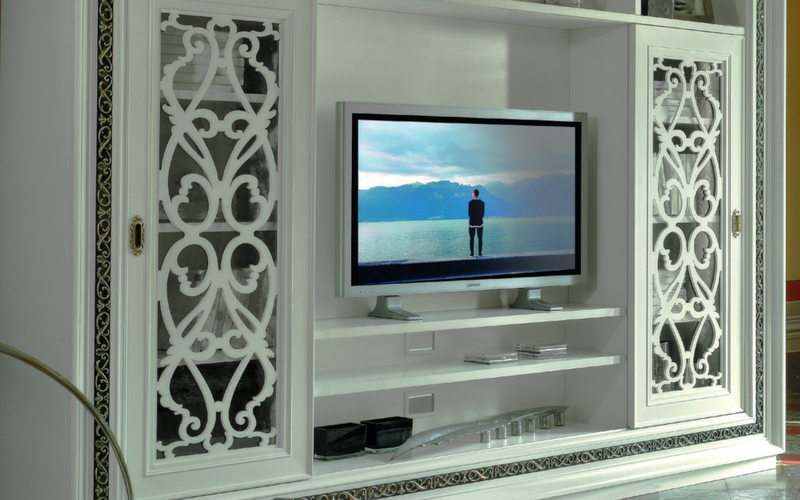 Vienna luxury classic storage units cabinet has sliding doors with decorative wooden perforated panels. Vienna by Orsitalia, wall units living room, is customizable and also the door’s laser cut wooden decorations can be lacquered in different color from all the wall shelves unit. Orsitalia produces living room storage furniture wall model Vienna also bigger and higher with two drawers. L. 274 x D. 46 x H. 222 cm. All the Baroque and classic contemporary pieces of furniture by Orsitalia are produced in Italy and are made of real lacquered or gilded or silvered wood. Gold and silver are still applied by hand to the structures of raw wood furniture to give a guarantee of durability. 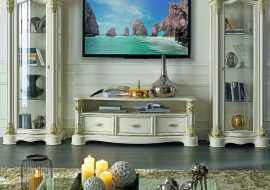 Orsitalia gives the possibility to customize the wall cabinet living room with modern colors and enamels or more classic finishes such as wenghè. Doors with perforated wood panels can be lacquered in contrast to the structure of the living room storage furniture wall. 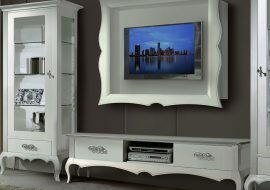 The wall cabinet living room is also produced in the large size, longer and taller version, with the addition of two drawers.